Citizens in the capital of Lebanon want to reclaim urban space and make it more liveable. During Beirut Design Week, Nathalie Harb demonstrated how parking lots can be upgraded to a green refuge by adding a second storey. Parking lots are being associated with a bad omen for gentrification development in Beirut. After old houses have been torn down, the empty space is often used for parking until the construction starts. Designers and activists tested various concepts in Jeanne D’Arc Street (could there be a more suitable place to start a civic protest?) that aim to reclaim urban space. The Beirut-based designer, Nathalie Harb, proposed this low-cost and easy-to-assemble scaffolding structure to be replicated over multiple parking spots. 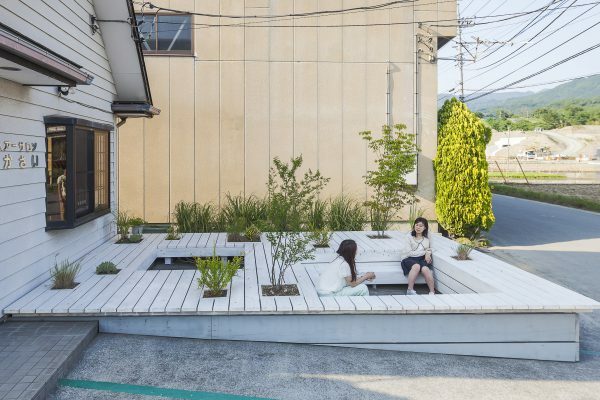 The space on the elevated platform is meant to become a neighbourhood garden that people can personalize with chairs, birdhouses and swings. Taking the stairs up to the second level provides a way to respite pollution and the view transforms into a tranquil urban oasis. Most of the urban space in Beirut was rebuilt into a luxury enclave, due to the city being almost completely demolished after Lebanon’s civil war ended. “If your entire downtown can be taken over by a real estate developer what are people fighting for?” says Mona El Hallak, director of Beirut Design Week. By experimenting with various concepts in public space, designers and activists want to encourage municipalities to think differently about public ownership. In the Netherlands, the city government of The Hague has taken action to encourage residents to minimize car use and utilize public transport instead. The initiative got residents to turn the empty parking space in front of their homes into an urban garden. Let’s hope that initiatives like this lead to more parks instead of parking in the future! Montreal builds on the parklet craze with innovative new urban spaces made from recycled shipping containers. California-based startup Orbital Insight tracks the performance of retail locations by using satellite imagery to analyze the number of parked cars over time.